The fortress lies on a granite outcrop on a spur of the Sandur range in Karnataka near to the border of Andhra Pradesh, overlooking the surrounding plain. The upper fort contained the citadel and several ancient tanks whereas the lower fort at the eastern base contained the arsenal. 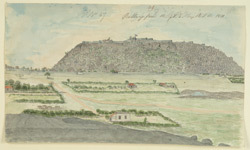 Bellary was a stronghold of Haidar Ali, however in 1800 it was ceded to the East India Company in lieu of payment for the maintenance of the British Subsidiary Force at Hyderabad.